Doncaster Knights completed a Championship double over Rotherham Titans last season and will be bidding to record another derby win in tomorrow’s game at Castle Park (2.30pm). The two rivals had contrasting fortunes on the opening day of the campaign at the weekend with Knights beating Jersey 26-24 in St Peter while the new-look Titans were beaten 45-10 by visiting Nottingham the following day. 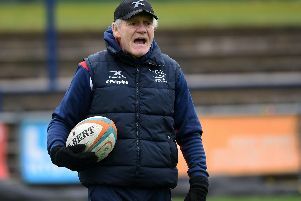 Knights’ coaching staff and several players were among the crowd at Clifton Lane running the rule over of a Rotherham side boasting 18 new signings and with a new coaching team at the helm. It was not the outcome that director of rugby Andy Keys had been hoping for in his first full season in charge, but his Doncaster counterpart Clive Griffiths is not reading too much into the result. “As I’ve said before, the form book goes out of the window in derby games,” said Griffiths. “They were a better side than us but the shoe has been on the other foot in recent years. “Having said that you still have to play well to win and you’ve still got to treat them with huge respect. “It could be argued that we are catching them at the right time as they look to gel. We’ve been in that situation ourselves and it can take time.